Let’s talk about school uniforms! I’m Amy from SewsNBows! I’m here to chat about some of the best PDF sewing patterns for school uniforms and accessories. My goal is to get you prepared to sew up a storm for back to school. If you don’t have enough time to get it all done, just pin this post. Pinning it is practically the same thing as doing it, right?! 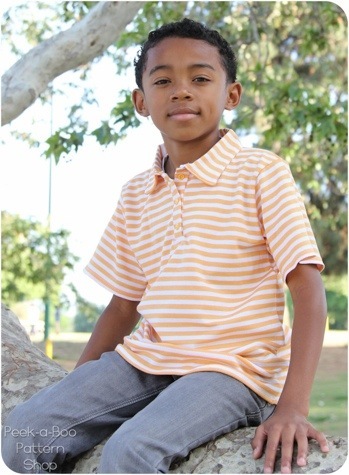 My top 3 picks for shirts should keep your littles well dressed all school year. Sleeveless v-neck vest with banded arm holes. Perfect to throw over a polo or button up top. Goes up to size 10. Mandarin collar with button placket, back yoke, and short or long sleeves. Includes sleeve tab and pocket options. Up to size 8. Long or short sleeved polo with collar & button placket. Unisex and easily customizable. Up to size 12. These 3 patterns will give you the most variation for your money, while staying within the dress code. The perfect khaki pants pattern for school uniforms. Also includes shorts length chinos. Up to size 12. A more casual alternative to chino shorts. Up to size 8. This skirt has a deep yoke with pleated or gathered option. Also includes a button placket variation. Up to size 16. These patterns will help transition your school uniform wardrobe in between seasons. This is a nice cardigan to wear in the classroom and keeps little arms warm. Up to size 12. This tie pairs nicely with a polo or button up. Also includes adult size and instructions to properly knot a tie. Basketball style shorts with curved or straight legs, panel piping or stripes, and faux or working drawstring waistband. These will look great in gym class! For smaller kids, this backpack is perfect for back to school! Pattern includes 2 versions. Handy lunchbox pattern with bonus snack pouch. If you want to get a head start on fall and winter wardrobe planning, check out this free printable checklist from Gracious Threads. Hope this helps you get geared up to sew. You might like some of my sewing boards on Pinterest. That’s where I pin all the things I want to sew…but never get around to making. Thanks for having me over, Irene! Thanks for having me over today!! Awe! Thank you so much Irene for showing my backpack!! What a fab line up! Thanks for sharing! I love that lunch sack. If only I were a more adventurous seamstress! Great picks Amy!!! Amy always comes up with the best pattern lists! Amy is AWESOME! Great collection!! Do you have a pattern for a 12 month Texas A&M corp uniform? I have been looking everywhere for one.